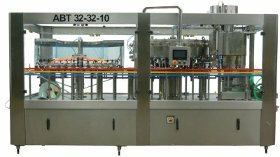 Bottle filler-closer monoblocks, rinser-filler-closer and filler-closer-labeller triblocks with an output of 800-1500 bph for filling of bottles, plastic flacons or metallic cans with ranging sizes of between 0.05 L - 2 L, with crown corker, screw sealing machine or corker, used for filling still fluids with exactly 1% precision. For the following utilization field: food industry: (for bottling of wine, alcohol syrup, honey, mustard, ketchup, alimentary oil etc), the cosmetics industry (for the bottling of shampoo, liquid soap, loations etc), the chemical industry (for liquid detergents, antifreezing solutions, chemical motor oils). Bale opener - depalletizer for glass bottles, for PET bottles and for other kind of plastique flacons with an output between 6000-12000 bph depending on the size of bottles. Manufactured in two types: with compressed-air and hose for glass bottles and with claw-slat gripping for PET bottles. Special machines and equipments by request. We undertake garantee for the sold machines and all the work performed by our company! Our company has been working in the bottling technology of food industry since 1983 and one of our main services is the overhauling of second-hand machines and production-lines. We undertake the responsibility of delivering reconditioned machines, production-lines in a short time for glass bottles, champagnes, metal cans, PET-flacons, as well as for the bottling of beer, wine, alcohol, with carbonated and noncarbonated liquids, soft drinks, mineral waters, alimentary oil, etc. We completely disassemble the previously bought machines whose origin is mainly Western Europe and renew them at our premises in Gyöngyös. The frames and the part items are shot blasted and spray painted. The damaged or faulty components are replaced. Each machine is equipped with new electrical instruments and for further demand with frequency controller and PLC system. 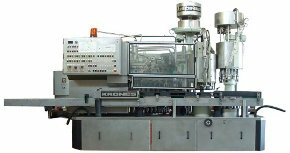 The selected machines are reconstructed according to the customer's request and equipped with parts needed for the ordered bottle dimensions. Bottle, crate and palette conveyor belts, air conveyors. According to the requested bottling parameters and Your demands we plan the factory and install the whole production-line at our premises for the required bottle, can or flacon dimensions. With your experts we put into operation the completed machine according to the reqiured working condition and after inspection we deliver it. During the work we undertake to accommodate and train a mechanician and an electrition at our company during their work.